Dragon Ball Xenoverse (PS4) Review: ROCK THE DRAGON! It’s finally here. The Dragon Ball game that we’ve all been waiting for has finally arrived! Dragon Ball Xenoverse! Bandai Namco redeems themselves with their latest installment by creating a DBZ game where players can fully delve into Toriyama’s universe by creating their own character! The game begins with Super Saiyan Goku engaged in battle with Frieza in his full powered final form. The player takes on Goku’s role allowing them to get a feel for the controls and after lowering Frieza’s health to a point, the game transitions to a cut-scene of his defeat, but he is later revived by a mysterious power allowing him to get an advantage over our hero. The scene later transitions to Gohan’s grueling fight against Cell. After mashing their Kamehameha waves, Gohan becomes overwhelmed by Cell’s burst of dark energy. Yes, the same enigmatic energy that restored Frieza in his fight with Goku. An unknown force is tampering with the history of our Z-Fighters which could possibly unravel the fabric of time itself. After bearing witness to history’s changes, Trunks resolves himself to defend time by summoning a powerful warrior to aid him. At this point in the game, the player creates their own unique character as a key component to the story. One of many customizable character options. 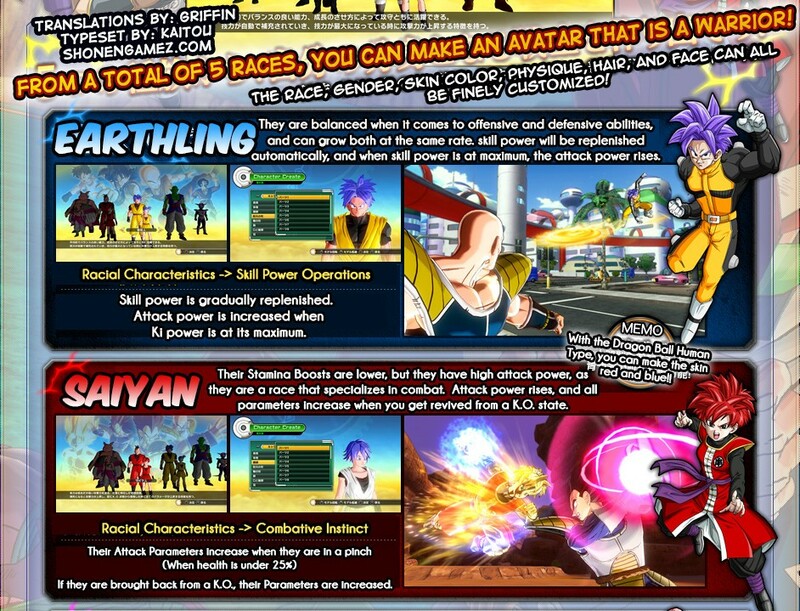 There are five playable races to choose from; Earthling, Saiyan, Majin, Namekian, and Frieza Clan. The only races that do not have females are the Namekian and Frieza race. Each of these classes has their own passive trait that gives the warrior an edge in combat. Earthlings, for example, specialize in ki-based attacks. They have balanced stats for offense and defense. Their ki gauge refills automatically over time and their attack power rises when the gauge is maxed out. Saiyans are probably (if not definitely) the most popular playable race. This class revolves around attack power. Saiyans have low health, but their strength increases once their HP reaches critical. If a Saiyan falls in battle and is revived by a teammate, all stats are raised. Males have stronger regular attacks with longer stat buffs, but their special skills are weaker. Females, on the other hand, have faster ki and stamina recovery, but have less health. Players are able to become a Super Saiyan and ascend to Super Saiyan 2 by completing the certain events in a quest or shell out their hard-earned Zeni and buy the skill from the shop. The Majin race has the best endurance. They have high defense, but slow stamina recovery. When the stamina gauge is full, the damage is mitigated. The male Majins have more health, but they move slower while their female counterparts have faster movement speed, but lower health. Namekians are known for their regenerative abilities. They have low attack power but have high HP and their stamina replenishes quickly. When their health reaches 70%, it regenerates automatically. Curatives are also more effective with this race compared to the other classes. Sadly, this playable race does not have the ability to transform into a Great Namek. Lastly, the Frieza clan excels in speed but wields low attack power. They possess an energy beam that paralyzes the opponent’s body which allows them to deal damage with their rapid strike attacks. When a Frieza kinsman’s health drops below 50%, their speed drastically increases. 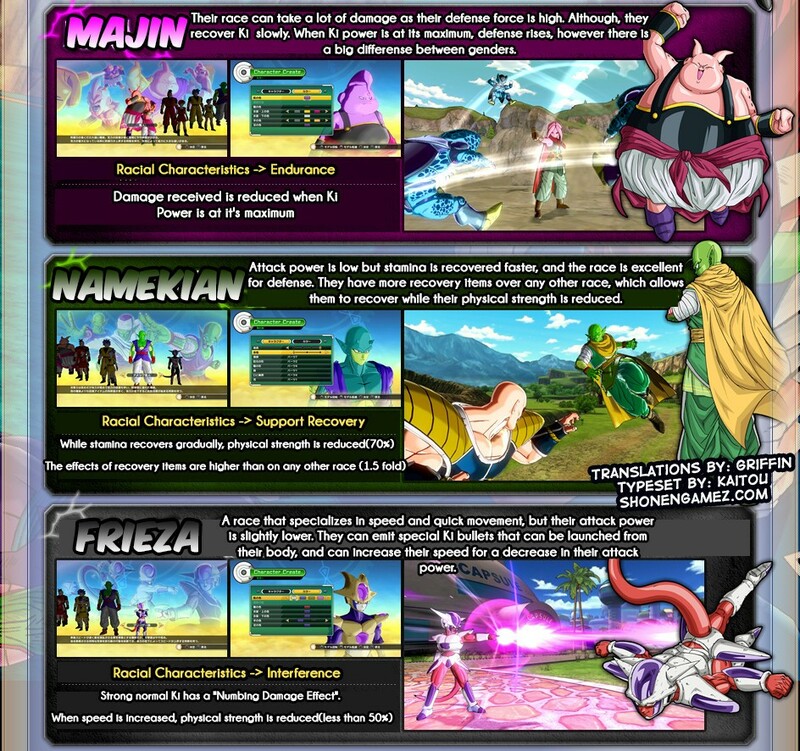 Players have the option to choose the stats suitable to their custom Frieza by selecting the race height. The taller the clansman, the higher the attack power, but its speed is reduced. Alternatively, the speed is increased the shorter the Frieza is, but its strength is decreased. Unfortunately, the player cannot transform with this race. After the player creates their character, they get to relive DBZ’s greatest battles and correct the diverging paths of history. Bandai Namco truly delivers hours upon hours of gameplay with a gripping story mode with a touch of Toriyama’s classic Dragon Ball humor. As the player advances the main plot, they have the opportunity to take on side missions to level their character and collect a myriad of items, outfits, and even skills! Quests rank from Z to D with Z at the highest. The higher the ranking, more collectibles are earned. 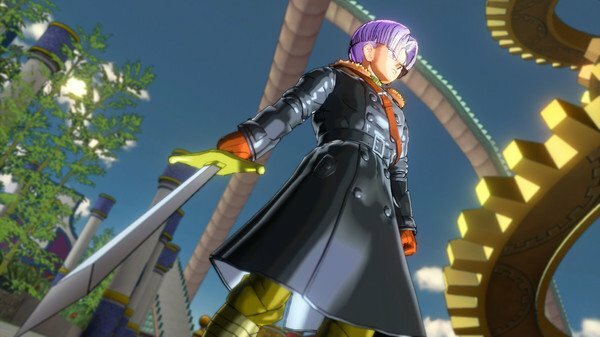 Dragon Ball Xenoverse plays a lot like Battle of Z with the ability to fight multiple opponents at one time and offers that free-roaming experience players are looking for in their game. It wouldn’t be a DBZ game if it didn’t come with destructible environments that you could crash your enemies through and this game doesn’t disappoint! Combat is very fluid and provides challenging opponents as the player continues the story. 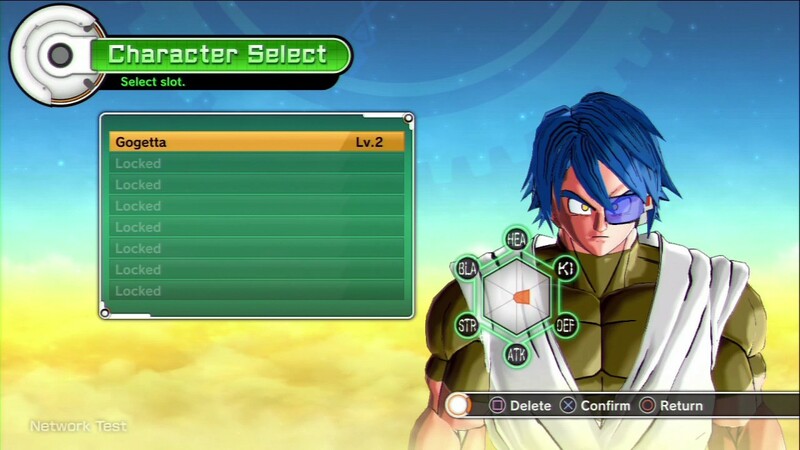 It also seems to take a few customization options from Ultimate Tenkaichi and Dragon Ball Online. This game far surpasses its predecessors, Battle of Z and Ultimate Tenkaichi by returning character creation, free movement and combat (no more Rock, Paper, Scissors! ), and real-time transformations! This game also has an offline two-player mode should you feel the need to pit your avatar’s strength against your friend’s favorite character. You can even battle worldwide in the online Budokai Tenkaichi Tournament! Another enjoyable feature is online quests you can do with other players. Join up to 3-on-3 matches, form your own team, even get them to help out on a difficult quest that you can’t fly solo with. You can even have your favorite DBZ character teach their skills as your master. The combat options are nearly limitless due to the fact you can change your skills at any time from the masters who taught you. My only gripes are the limited transformations for the other races (the only transformation they can use is Kaioken) and the lack of the ability to charge ki. They’ve made charging into a skill now to harness your ki energy. The default way to build up energy now is by fighting, blocking, or taking damage. As for the graphics, it’s one of Bandai Namco’s specialties. With games like the Ultimate Ninja Storm series under their belt, their graphics give off the impression of playing an interactive episode of Dragon Ball Z! Let’s not forget about the music either. Nothing gets a DBZ fan more hyped than a fight riff that gets them pumped against a formidable foe! I honestly believe this was the DBZ game that we were all waiting for. Could it be better? Of course! I’m bothered by the lack of transformation love for the other races, but I believe if Bandai Namco made a sequel, they shall rectify this error! Other than that, it’s a highly enjoyable game with a completely original story filled with old and new characters! It also brings fans together to compete, play, and join together to share the love of the adventure we all grew up with. By far, it exceeds Battle of Z and Ultimate Tenkaichi in every way, but it still has room to grow! I’m holding out with high hopes for future DBZ games to come because of Xenoverse!